Review: "Zero Hour: The Towers of Avarice" - Sea of Tranquility - The Web Destination for Progressive Music! 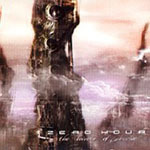 Zero Hour's second album, The Towers of Avarice, is possibly the most essential technical prog metal album of the millennium. It differs vastly from other bands' works in that it is characterized by an instantly recognisable songwriting aura, with machine-like instrument precision, incredibly haunting vocals, terrific lyrics, and superb production. In short, it offers everything fans of technical progressive metal expect. It is uncompromisingly heavy and capped by relentless riffage, excellent drum and bass work, and minimal keyboards to achieve atmosphere. However, rather than opting for one-dimensional, single-minded technical prowess, their music also presents a strong emotional impact from start to finish. "The Subterranean" is equally heavy; it begins with a choppy, muted riff and prominent bass and drum attacks before it all disappears under a hugely melodic guitar theme that exalts Rosvold's majestic screams. Harsher and heavier staccato riffs return to the centre of the track for a superlative finale. "Strategem" is almost entirely bass driven, decorated with sprinkles of keyboards in the intro and laser-precise guitars strung across. Full of asymmetric rhythm shifts, this may be the most complex song on the album. It is busy with great breakdowns, more Becker-like sweeping, and sudden tempo changes. At its heaviest and most crushing moment, the song breaks into eerie silences filled with gentle keyboards and clean, melodic vocals. Rosvold's "Drop drop drop and liquify, I'll give the world to you, drop drop drop to sanctify, I promise only truth" quite possibly being the most moving vocal melody on the album. Not only is it memorable, but Rosvold's enunciation makes it all the more more powerful as well. Back to an aggressive final section, he sings in an angry tone almost identical to that of Jon Oliva's, particularly between 6:36 and 6:59. The next song will prove anyone who thinks progressive metal has no emotion wrong. These people should hear "Reflections" before opening their mouth. Based entirely around acoustic guitars and synth effects, the lyrics and singing on this track elevate it among prog's most emotional songs ever. Rosvold sings with so much passion and control that he could give Daniel Gildenlow a run for his money. His amazing lyrics need to be mentioned again: "I crawled along a cracked and narrow path, I saw my reflection in some broken glass, it was blood red, blood red..." stressing the last two words emphatically. "Demise and Vestige" is the centrepiece of the album. Over fifteen minutes, the first couple of minutes are mostly driven by Troy Tipton's bass and Mike Guy's drum accompaniment. Soon enough, well-timed strikes of distorted guitars crack the icy wall of sound, and generate an awe-inspiring riff motif. It is a very technical song, but somehow manages to maintain its dramatic inertia. The melodic vocals over sombre acoustic guitars at first and the repeated "Fade Away!" screams atop cutting electric leads later on suggest it's difficult to believe how diverse Rosvold's voice really is. The second half of the song is creepier, highlighted by more melodic lines and even gorgeous harmonies. "Ghosts of Dawn" is an atmospheric track to conclude the album. Keyboard effects, strings and plaintive vocals unite, stressing Rosvold's "Death comes to those who hate" lyrics and leaving the listener shuddering in awe. Dino Alden is the best producer (along with Neil Kernon) for this type of music around, and he always delivers the goods, with clear-cut sound separation and a punching sonic quality. Add to this the amazing artwork by Travis Smith and you have a flawless masterpiece. Since its release in 2001, this disc still gets regular plays and refuses to get old or boring. It is simply astonishing. * Erik Rosvold left the band shortly before the band's third album A Fragile Mind was recorded. Fred Marshall, the singer on this disc, has also parted ways, leaving his position to former Power of Omens vocalist Chris Salinas. The band is currently working on their new disc slated for a fall release. This is an excellent release and could quite possibly be the best that the band has done. The only thing missing is some extra guitar solos! Godly!